For the scientific journal, see Carcinogenesis (journal). Cancers and tumors are caused by a series of mutations. Each mutation alters the behavior of the cell somewhat. Carcinogenesis, also called oncogenesis or tumorigenesis, is the formation of a cancer, whereby normal cells are transformed into cancer cells. The process is characterized by changes at the cellular, genetic, and epigenetic levels and abnormal cell division. Cell division is a physiological process that occurs in almost all tissues and under a variety of circumstances. Normally the balance between proliferation and programmed cell death, in the form of apoptosis, is maintained to ensure the integrity of tissues and organs. According to the prevailing accepted theory of carcinogenesis, the somatic mutation theory, mutations in DNA and epimutations that lead to cancer disrupt these orderly processes by disrupting the programming regulating the processes, upsetting the normal balance between proliferation and cell death. This results in uncontrolled cell division and the evolution of those cells by natural selection in the body. Only certain mutations lead to cancer whereas the majority of mutations do not. Variants of inherited genes may predispose individuals to cancer. In addition, environmental factors such as carcinogens and radiation cause mutations that may contribute to the development of cancer. Finally random mistakes in normal DNA replication may result in cancer causing mutations. A series of several mutations to certain classes of genes is usually required before a normal cell will transform into a cancer cell. On average, for example, 15 "driver mutations" and 60 "passenger" mutations are found in colon cancers. Mutations in genes that regulate cell division, apoptosis (cell death), and DNA repair may result in uncontrolled cell proliferation and cancer. Cancer is fundamentally a disease of regulation of tissue growth. In order for a normal cell to transform into a cancer cell, genes that regulate cell growth and differentiation must be altered. Genetic and epigenetic changes can occur at many levels, from gain or loss of entire chromosomes, to a mutation affecting a single DNA nucleotide, or to silencing or activating a microRNA that controls expression of 100 to 500 genes. There are two broad categories of genes that are affected by these changes. Oncogenes may be normal genes that are expressed at inappropriately high levels, or altered genes that have novel properties. In either case, expression of these genes promotes the malignant phenotype of cancer cells. Tumor suppressor genes are genes that inhibit cell division, survival, or other properties of cancer cells. Tumor suppressor genes are often disabled by cancer-promoting genetic changes. Finally Oncovirinae, viruses that contain an oncogene, are categorized as oncogenic because they trigger the growth of tumorous tissues in the host. This process is also referred to as viral transformation. There is a diverse classification scheme for the various genomic changes that may contribute to the generation of cancer cells. Many of these changes are mutations, or changes in the nucleotide sequence of genomic DNA. There are also many epigenetic changes that alter whether genes are expressed or not expressed. Aneuploidy, the presence of an abnormal number of chromosomes, is one genomic change that is not a mutation, and may involve either gain or loss of one or more chromosomes through errors in mitosis. Large-scale mutations involve the deletion or gain of a portion of a chromosome. Genomic amplification occurs when a cell gains many copies (often 20 or more) of a small chromosomal region, usually containing one or more oncogenes and adjacent genetic material. Translocation occurs when two separate chromosomal regions become abnormally fused, often at a characteristic location. A well-known example of this is the Philadelphia chromosome, or translocation of chromosomes 9 and 22, which occurs in chronic myelogenous leukemia, and results in production of the BCR-abl fusion protein, an oncogenic tyrosine kinase. Small-scale mutations include point mutations, deletions, and insertions, which may occur in the promoter of a gene and affect its expression, or may occur in the gene's coding sequence and alter the function or stability of its protein product. Disruption of a single gene may also result from integration of genomic material from a DNA virus or retrovirus, and such an event may also result in the expression of viral oncogenes in the affected cell and its descendants. DNA damage is considered to be the primary cause of cancer. More than 60,000 new naturally occurring DNA damages arise, on average, per human cell, per day, due to endogenous cellular processes (see article DNA damage (naturally occurring)). DNA damages can also be caused by endogenous (naturally occurring) agents. Macrophages and neutrophils in an inflamed colonic epithelium are the source of reactive oxygen species causing the DNA damages that initiate colonic tumorigenesis, and bile acids, at high levels in the colons of humans eating a high fat diet, also cause DNA damage and contribute to colon cancer. In sporadic cancers, a deficiency in DNA repair is occasionally due to a mutation in a DNA repair gene, but much more frequently reduced or absent expression of DNA repair genes is due to epigenetic alterations that reduce or silence gene expression. This is indicated in the figure at the 3rd level from the top. For example, for 113 colorectal cancers examined in sequence, only four had a missense mutation in the DNA repair gene MGMT, while the majority had reduced MGMT expression due to methylation of the MGMT promoter region (an epigenetic alteration). The cells in which all these DNA alterations accumulate are difficult to trace, but two recent lines of evidence suggest that normal stem cells may be the cells of origin in cancers. First, there exists a highly positive correlation (Spearman’s rho = 0.81; P < 3.5 × 10−8) between the risk of developing cancer in a tissue and the number of normal stem cell divisions taking place in that same tissue. The correlation applied to 31 cancer types and extended across five orders of magnitude. This correlation means that if the normal stem cells from a tissue divide once, the cancer risk in that tissue is approximately 1X. If they divide 1,000 times, the cancer risk is 1,000X. And if the normal stem cells from a tissue divide 100,000 times, the cancer risk in that tissue is approximately 100,000X. This strongly suggests that the main reason we have cancer is that our normal stem cells divide, which implies that cancer originates in normal stem cells. Second, statistics show that most human cancers are diagnosed in aged people. A possible explanation is that cancers occur because cells accumulate damage through time. DNA is the only cellular component that can accumulate damage over the entire course of a life, and stem cells are the only cells that can transmit DNA from the zygote to cells late in life. Other cells cannot keep DNA from the beginning of life until a possible cancer occurs. This implies that most cancers arise from normal stem cells. Field defects have been identified in association with cancers and are important in progression to cancer. However, it was pointed out by Rubin that "the vast majority of studies in cancer research has been done on well-defined tumors in vivo, or on discrete neoplastic foci in vitro. Yet there is evidence that more than 80% of the somatic mutations found in mutator phenotype human colorectal tumors occur before the onset of terminal clonal expansion…" More than half of somatic mutations identified in tumors occurred in a pre-neoplastic phase (in a field defect), during growth of apparently normal cells. It would also be expected that many of the epigenetic alterations present in tumors may have occurred in pre-neoplastic field defects. In the colon, a field defect probably arises by natural selection of a mutant or epigenetically altered cell among the stem cells at the base of one of the intestinal crypts on the inside surface of the colon. A mutant or epigenetically altered stem cell may replace the other nearby stem cells by natural selection. This may cause a patch of abnormal tissue to arise. The figure in this section includes a photo of a freshly resected and lengthwise-opened segment of the colon showing a colon cancer and four polyps. 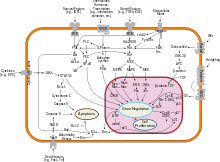 Below the photo there is a schematic diagram of how a large patch of mutant or epigenetically altered cells may have formed, shown by the large area in yellow in the diagram. Within this first large patch in the diagram (a large clone of cells), a second such mutation or epigenetic alteration may occur so that a given stem cell acquires an advantage compared to other stem cells within the patch, and this altered stem cell may expand clonally forming a secondary patch, or sub-clone, within the original patch. This is indicated in the diagram by four smaller patches of different colors within the large yellow original area. Within these new patches (sub-clones), the process may be repeated multiple times, indicated by the still smaller patches within the four secondary patches (with still different colors in the diagram) which clonally expand, until stem cells arise that generate either small polyps or else a malignant neoplasm (cancer). In the photo, an apparent field defect in this segment of a colon has generated four polyps (labeled with the size of the polyps, 6mm, 5mm, and two of 3mm, and a cancer about 3 cm across in its longest dimension). These neoplasms are also indicated (in the diagram below the photo) by 4 small tan circles (polyps) and a larger red area (cancer). The cancer in the photo occurred in the cecal area of the colon, where the colon joins the small intestine (labeled) and where the appendix occurs (labeled). The fat in the photo is external to the outer wall of the colon. In the segment of colon shown here, the colon was cut open lengthwise to expose the inner surface of the colon and to display the cancer and polyps occurring within the inner epithelial lining of the colon. Cancers are known to exhibit genome instability or a mutator phenotype. The protein-coding DNA within the nucleus is about 1.5% of the total genomic DNA. Within this protein-coding DNA (called the exome), an average cancer of the breast or colon can have about 60 to 70 protein altering mutations, of which about 3 or 4 may be "driver" mutations, and the remaining ones may be "passenger" mutations. However, the average number of DNA sequence mutations in the entire genome (including non-protein-coding regions) within a breast cancer tissue sample is about 20,000. In an average melanoma tissue sample (where melanomas have a higher exome mutation frequency) the total number of DNA sequence mutations is about 80,000. These high frequencies of mutations in the total nucleotide sequences within cancers suggest that often an early alteration in the field defect giving rise to a cancer (e.g. yellow area in the diagram in the preceding section) is a deficiency in DNA repair. Large field defects surrounding colon cancers (extending to about 10 cm on each side of a cancer) are found to frequently have epigenetic defects in 2 or 3 DNA repair proteins (ERCC1, XPF and/or PMS2) in the entire area of the field defect. When expression of DNA repair genes is reduced, DNA damages accumulate in cells at a higher than normal level, and these excess damages cause increased frequencies of mutation and/or epimutation. Mutation rates strongly increase in cells defective in DNA mismatch repair or in homologous recombinational repair (HRR). A deficiency in DNA repair, itself, can allow DNA damages to accumulate, and error-prone translesion synthesis past some of those damages may give rise to mutations. In addition, faulty repair of these accumulated DNA damages may give rise to epimutations. These new mutations and/or epimutations may provide a proliferative advantage, generating a field defect. Although the mutations/epimutations in DNA repair genes do not, themselves, confer a selective advantage, they may be carried along as passengers in cells when the cell acquires an additional mutation/epimutation that does provide a proliferative advantage. A number of authors have questioned the assumption that cancers result from sequential random mutations as oversimplistic, suggesting instead that cancer results from a failure of the body to inhibit an innate, programmed proliferative tendency. A related theory developed by astrobiologists suggests that cancer is an atavism, an evolutionary throwback to an earlier form of multicellular life. The genes responsible for uncontrolled cell growth and cooperation between cancer cells are very similar to those that enabled the first multicellular life forms to group together and flourish. These genes still exist within the genome of more complex metazoans, such as humans, although more recently evolved genes keep them in check. When the newer controlling genes fail for whatever reason, the cell can revert to its more primitive programming and reproduce out of control. The theory is an alternative to the notion that cancers begin with rogue cells that undergo evolution within the body. Instead they possess a fixed number of primitive genes that are progressively activated, giving them finite variability. Another evolutionary theory puts the roots of cancer back to the origin of the eukarote (nucleated) cell by massive horizontal gene transfer, when the genomes of infecting viruses were cleaved (and thereby attenuated) by the host, but their fragments integrated into the host genome as immune protection. Cancer now originates when a rare somatic mutation recombines such fragments into a functional driver of cell proliferation. Tissue can be organized in a continuous spectrum from normal to cancer. Normally, once a tissue is injured or infected, damaged cells elicit inflammation, by stimulating specific patterns of enzyme activity and cytokine gene expression on surrounding cells. Discrete clusters of molecules are secreted, which act as mediators, inducing the activity of subsequent cascades of biochemical changes. Each cytokine binds to specific receptors on various cell types, and each cell type responds differently by altering the activity of intracellular signal transduction pathways, depending on the receptors that the cell expresses and the signaling molecules present inside the cell. Collectively, this reprogramming process induces a stepwise change in cell phenotypes, which will ultimately lead to restoration of tissue function and toward regaining essential structural integrity. A tissue can thereby heal, depending on the productive communication between the cells present at the site of damage, and the immune system. Key factor in healing is the regulation of cytokine gene expression, which enables complementary groups of cells to respond to inflammatory mediators in a manner that gradually produces essential changes in tissue physiology. Cancer cells have either permanent (genetic) or reversible (epigenetic) changes on their genome, which partly inhibit their communication with surrounding cells and with the immune system. Cancer cells do not communicate with their tissue microenvironment in a manner that protects tissue integrity; instead, the movement and the survival of cancer cells become possible in locations where they can impair tissue function. Cancer cells survive by rewiring signal pathways that normally protect the tissue from the immune system. One example for rewiring of tissue function in cancer is the activity of transcription factor NF-κB. NF-κB activates the expression of numerous genes that are involved in the transition between inflammation and regeneration, which encode cytokines, adhesion factors, and other molecules that can change cell fate. This reprogramming of cellular phenotypes normally allows the development of a fully functional intact tissue. NF-κB activity is tightly controlled by multiple proteins, which collectively ensure that only discrete clusters of genes are induced by NF-κB in a given cell and at a given time. This tight regulation of signal exchange between cells, protects the tissue from excessive inflammation, and ensures that different cell types would gradually acquire complementary functions, and specific positions. Failure of this mutual regulation between genetic reprogramming and cell interactions allows cancer cells to give rise to metastasis. Cancer cells respond aberrantly to cytokines, and activate signal cascades that can protect them from the immune system. The role of iodine in marine fishes (rich in iodine) and freshwater fishes (iodine-deficient) is not completely understood, but it has been reported that freshwater fishes are more susceptible to infectious and, in particular, neoplastic and atherosclerotic diseases, of marine fishes. Marine elasmobranch fishes such as sharks, stingrays etc. are much less affected by cancer than freshwater fishes, and therefore have stimulated medical research to better understand carcinogenesis so it can be useful in other animals and especially in humans. In order for cells to start dividing uncontrollably, genes that regulate cell growth must be dysregulated. Proto-oncogenes are genes that promote cell growth and mitosis, whereas tumor suppressor genes discourage cell growth, or temporarily halt cell division to carry out DNA repair. Typically, a series of several mutations to these genes is required before a normal cell transforms into a cancer cell. This concept is sometimes termed "oncoevolution." Mutations to these genes provide the signals for tumor cells to start dividing uncontrollably. But the uncontrolled cell division that characterizes cancer also requires that the dividing cell duplicates all its cellular components to create two daughter cells. The activation of anaerobic glycolysis (the Warburg effect), which is not necessarily induced by mutations in proto-oncogenes and tumor suppressor genes, provides most of the building blocks required to duplicate the cellular components of a dividing cell and, therefore, is also essential for carcinogenesis. Proto-oncogenes promote cell growth in a variety of ways. Many can produce hormones, "chemical messengers" between cells that encourage mitosis, the effect of which depends on the signal transduction of the receiving tissue or cells. Some are responsible for the signal transduction system and signal receptors in cells and tissues themselves, thus controlling the sensitivity to such hormones. They often produce mitogens, or are involved in transcription of DNA in protein synthesis, which create the proteins and enzymes responsible for producing the products and biochemicals cells use and interact with. Mutations in proto-oncogenes can modify their expression and function, increasing the amount or activity of the product protein. When this happens, they become oncogenes, and, thus, cells have a higher chance of dividing excessively and uncontrollably. The chance of cancer cannot be reduced by removing proto-oncogenes from the genome, as they are critical for growth, repair and homeostasis of the body. It is only when they become mutated that the signals for growth become excessive. It is important to note that a gene possessing a growth-promoting role may increase the carcinogenic potential of a cell, under the condition that all necessary cellular mechanisms that permit growth are activated. This condition also includes the inactivation of specific tumor suppressor genes (see below). If the condition is not fulfilled, the cell may cease to grow and can proceed to die. This makes identification of the stage and type of cancer cell that grows under the control of a given oncogene crucial for the development of treatment strategies. Many tumor suppressor genes effect signal transduction pathways that regulate apoptosis, also known as "programmed cell death". A new idea announced in 2011 is an extreme version of multiple mutations, called chromothripsis by its proponents. This idea, affecting only 2–3% of cases of cancer, although up to 25% of bone cancers, involves the catastrophic shattering of a chromosome into tens or hundreds of pieces and then being patched back together incorrectly. This shattering probably takes place when the chromosomes are compacted during normal cell division, but the trigger for the shattering is unknown. Under this model, cancer arises as the result of a single, isolated event, rather than the slow accumulation of multiple mutations. Depending on their location, cells can be damaged through radiation, chemicals from cigarette smoke, and inflammation from bacterial infection or other viruses. Each cell has a chance of damage. Cells often die if they are damaged, through failure of a vital process or the immune system, however sometimes damage will knock out a single cancer gene. In an old person, there are thousands, tens of thousands or hundreds of thousands of knocked-out cells. The chance that any one would form a cancer is very low. ^ Tomasetti C, Li L, Vogelstein B (23 March 2017). "Stem cell divisions, somatic mutations, cancer etiology, and cancer prevention". Science. 355 (6331): 1330–1334. doi:10.1126/science.aaf9011. PMC 5852673. PMID 28336671. ^ a b Wood LD, Parsons DW, Jones S, Lin J, Sjöblom T, Leary RJ, et al. (November 2007). "The genomic landscapes of human breast and colorectal cancers". Science. 318 (5853): 1108–13. CiteSeerX 10.1.1.218.5477. doi:10.1126/science.1145720. PMID 17932254. ^ a b Knudson AG (November 2001). "Two genetic hits (more or less) to cancer". Nature Reviews. Cancer. 1 (2): 157–62. doi:10.1038/35101031. PMID 11905807. ^ Fearon ER, Vogelstein B (June 1990). "A genetic model for colorectal tumorigenesis". Cell. 61 (5): 759–67. doi:10.1016/0092-8674(90)90186-I. PMID 2188735. ^ a b c Belikov, Aleksey V. (22 September 2017). "The number of key carcinogenic events can be predicted from cancer incidence". Scientific Reports. 7 (1): 12170. doi:10.1038/s41598-017-12448-7. PMC 5610194. PMID 28939880. ^ Lim LP, Lau NC, Garrett-Engele P, Grimson A, Schelter JM, Castle J, Bartel DP, Linsley PS, Johnson JM (February 2005). "Microarray analysis shows that some microRNAs downregulate large numbers of target mRNAs". Nature. 433 (7027): 769–73. doi:10.1038/nature03315. PMID 15685193. ^ a b Balaguer F, Link A, Lozano JJ, Cuatrecasas M, Nagasaka T, Boland CR, Goel A (August 2010). "Epigenetic silencing of miR-137 is an early event in colorectal carcinogenesis". Cancer Research. 70 (16): 6609–18. doi:10.1158/0008-5472.CAN-10-0622. PMC 2922409. PMID 20682795. ^ Kastan MB (April 2008). "DNA damage responses: mechanisms and roles in human disease: 2007 G.H.A. Clowes Memorial Award Lecture". Molecular Cancer Research. 6 (4): 517–24. doi:10.1158/1541-7786.MCR-08-0020. PMID 18403632. ^ a b Cunningham FH, Fiebelkorn S, Johnson M, Meredith C (November 2011). "A novel application of the Margin of Exposure approach: segregation of tobacco smoke toxicants". Food and Chemical Toxicology. 49 (11): 2921–33. doi:10.1016/j.fct.2011.07.019. PMID 21802474. ^ Kanavy HE, Gerstenblith MR (December 2011). "Ultraviolet radiation and melanoma". Seminars in Cutaneous Medicine and Surgery. 30 (4): 222–8. doi:10.1016/j.sder.2011.08.003. PMID 22123420. ^ Handa O, Naito Y, Yoshikawa T (2011). "Redox biology and gastric carcinogenesis: the role of Helicobacter pylori". Redox Report. 16 (1): 1–7. doi:10.1179/174329211X12968219310756. PMID 21605492. ^ Smela ME, Hamm ML, Henderson PT, Harris CM, Harris TM, Essigmann JM (May 2002). "The aflatoxin B(1) formamidopyrimidine adduct plays a major role in causing the types of mutations observed in human hepatocellular carcinoma". Proceedings of the National Academy of Sciences of the United States of America. 99 (10): 6655–60. doi:10.1073/pnas.102167699. PMC 124458. PMID 12011430. ^ Katsurano M, Niwa T, Yasui Y, Shigematsu Y, Yamashita S, Takeshima H, Lee MS, Kim YJ, Tanaka T, Ushijima T (January 2012). "Early-stage formation of an epigenetic field defect in a mouse colitis model, and non-essential roles of T- and B-cells in DNA methylation induction". Oncogene. 31 (3): 342–51. doi:10.1038/onc.2011.241. PMID 21685942. ^ Bernstein C, Holubec H, Bhattacharyya AK, Nguyen H, Payne CM, Zaitlin B, Bernstein H (August 2011). "Carcinogenicity of deoxycholate, a secondary bile acid". Archives of Toxicology. 85 (8): 863–71. doi:10.1007/s00204-011-0648-7. PMC 3149672. PMID 21267546. ^ Fearon ER (November 1997). "Human cancer syndromes: clues to the origin and nature of cancer". Science. 278 (5340): 1043–50. doi:10.1126/science.278.5340.1043. PMID 9353177. ^ Lichtenstein P, Holm NV, Verkasalo PK, Iliadou A, Kaprio J, Koskenvuo M, Pukkala E, Skytthe A, Hemminki K (July 2000). "Environmental and heritable factors in the causation of cancer--analyses of cohorts of twins from Sweden, Denmark, and Finland". The New England Journal of Medicine. 343 (2): 78–85. doi:10.1056/NEJM200007133430201. PMID 10891514. ^ Halford S, Rowan A, Sawyer E, Talbot I, Tomlinson I (June 2005). "O(6)-methylguanine methyltransferase in colorectal cancers: detection of mutations, loss of expression, and weak association with G:C>A:T transitions". Gut. 54 (6): 797–802. doi:10.1136/gut.2004.059535. PMC 1774551. PMID 15888787. ^ a b Narayanan L, Fritzell JA, Baker SM, Liskay RM, Glazer PM (April 1997). "Elevated levels of mutation in multiple tissues of mice deficient in the DNA mismatch repair gene Pms2". Proceedings of the National Academy of Sciences of the United States of America. 94 (7): 3122–7. doi:10.1073/pnas.94.7.3122. PMC 20332. PMID 9096356. ^ a b Hegan DC, Narayanan L, Jirik FR, Edelmann W, Liskay RM, Glazer PM (December 2006). "Differing patterns of genetic instability in mice deficient in the mismatch repair genes Pms2, Mlh1, Msh2, Msh3 and Msh6". Carcinogenesis. 27 (12): 2402–8. doi:10.1093/carcin/bgl079. PMC 2612936. PMID 16728433. ^ a b Tutt AN, van Oostrom CT, Ross GM, van Steeg H, Ashworth A (March 2002). "Disruption of Brca2 increases the spontaneous mutation rate in vivo: synergism with ionizing radiation". EMBO Reports. 3 (3): 255–60. doi:10.1093/embo-reports/kvf037. PMC 1084010. PMID 11850397. ^ Villeneuve PJ, Mao Y (November 1994). "Lifetime probability of developing lung cancer, by smoking status, Canada". Canadian Journal of Public Health. 85 (6): 385–8. PMID 7895211. ^ Gerlinger M, Rowan AJ, Horswell S, Larkin J, Endesfelder D, Gronroos E, et al. (March 2012). "Intratumor heterogeneity and branched evolution revealed by multiregion sequencing". The New England Journal of Medicine. 366 (10): 883–92. doi:10.1056/NEJMoa1113205. PMC 4878653. PMID 22397650. ^ a b López-Lázaro M (August 2015). "Stem cell division theory of cancer". Cell Cycle. 14 (16): 2547–8. doi:10.1080/15384101.2015.1062330. PMC 5242319. PMID 26090957. ^ a b c López-Lázaro M (May 2015). "The migration ability of stem cells can explain the existence of cancer of unknown primary site. Rethinking metastasis". Oncoscience. 2 (5): 467–75. doi:10.18632/oncoscience.159. PMC 4468332. PMID 26097879. ^ Tomasetti C, Vogelstein B (January 2015). "Cancer etiology. Variation in cancer risk among tissues can be explained by the number of stem cell divisions". Science. 347 (6217): 78–81. doi:10.1126/science.1260825. PMC 4446723. PMID 25554788. ^ Slaughter DP, Southwick HW, Smejkal W (September 1953). "Field cancerization in oral stratified squamous epithelium; clinical implications of multicentric origin". Cancer. 6 (5): 963–8. doi:10.1002/1097-0142(195309)6:5<963::AID-CNCR2820060515>3.0.CO;2-Q. PMID 13094644. ^ Bernstein C, Bernstein H, Payne CM, Dvorak K, Garewal H (February 2008). "Field defects in progression to gastrointestinal tract cancers". review. Cancer Letters. 260 (1–2): 1–10. doi:10.1016/j.canlet.2007.11.027. PMC 2744582. PMID 18164807. ^ Nguyen H, Loustaunau C, Facista A, Ramsey L, Hassounah N, Taylor H, Krouse R, Payne CM, Tsikitis VL, Goldschmid S, Banerjee B, Perini RF, Bernstein C (2010). "Deficient Pms2, ERCC1, Ku86, CcOI in field defects during progression to colon cancer". Journal of Visualized Experiments: JoVE (41): 1931. doi:10.3791/1931. PMC 3149991. PMID 20689513. ^ Rubin H (March 2011). "Fields and field cancerization: the preneoplastic origins of cancer: asymptomatic hyperplastic fields are precursors of neoplasia, and their progression to tumors can be tracked by saturation density in culture". BioEssays. 33 (3): 224–31. doi:10.1002/bies.201000067. PMID 21254148. ^ Tsao JL, Yatabe Y, Salovaara R, Järvinen HJ, Mecklin JP, Aaltonen LA, Tavaré S, Shibata D (February 2000). "Genetic reconstruction of individual colorectal tumor histories". Proceedings of the National Academy of Sciences of the United States of America. 97 (3): 1236–41. doi:10.1073/pnas.97.3.1236. PMC 15581. PMID 10655514. ^ a b c Vogelstein B, Papadopoulos N, Velculescu VE, Zhou S, Diaz LA, Kinzler KW (March 2013). "Cancer genome landscapes". review. Science. 339 (6127): 1546–58. doi:10.1126/science.1235122. PMC 3749880. PMID 23539594. ^ Shen L, Kondo Y, Rosner GL, Xiao L, Hernandez NS, Vilaythong J, Houlihan PS, Krouse RS, Prasad AR, Einspahr JG, Buckmeier J, Alberts DS, Hamilton SR, Issa JP (September 2005). "MGMT promoter methylation and field defect in sporadic colorectal cancer". Journal of the National Cancer Institute. 97 (18): 1330–8. doi:10.1093/jnci/dji275. PMID 16174854. ^ a b Lee KH, Lee JS, Nam JH, Choi C, Lee MC, Park CS, Juhng SW, Lee JH (October 2011). "Promoter methylation status of hMLH1, hMSH2, and MGMT genes in colorectal cancer associated with adenoma-carcinoma sequence". Langenbeck's Archives of Surgery. 396 (7): 1017–26. doi:10.1007/s00423-011-0812-9. PMID 21706233. ^ Svrcek M, Buhard O, Colas C, Coulet F, Dumont S, Massaoudi I, et al. (November 2010). "Methylation tolerance due to an O6-methylguanine DNA methyltransferase (MGMT) field defect in the colonic mucosa: an initiating step in the development of mismatch repair-deficient colorectal cancers". Gut. 59 (11): 1516–26. doi:10.1136/gut.2009.194787. PMID 20947886. ^ a b c d Facista A, Nguyen H, Lewis C, Prasad AR, Ramsey L, Zaitlin B, Nfonsam V, Krouse RS, Bernstein H, Payne CM, Stern S, Oatman N, Banerjee B, Bernstein C (April 2012). "Deficient expression of DNA repair enzymes in early progression to sporadic colon cancer". Genome Integrity. 3 (1): 3. doi:10.1186/2041-9414-3-3. PMC 3351028. PMID 22494821. ^ Paluszczak J, Misiak P, Wierzbicka M, Woźniak A, Baer-Dubowska W (February 2011). "Frequent hypermethylation of DAPK, RARbeta, MGMT, RASSF1A and FHIT in laryngeal squamous cell carcinomas and adjacent normal mucosa". Oral Oncology. 47 (2): 104–7. doi:10.1016/j.oraloncology.2010.11.006. PMID 21147548. ^ Zuo C, Zhang H, Spencer HJ, Vural E, Suen JY, Schichman SA, Smoller BR, Kokoska MS, Fan CY (October 2009). "Increased microsatellite instability and epigenetic inactivation of the hMLH1 gene in head and neck squamous cell carcinoma". Otolaryngology–Head and Neck Surgery. 141 (4): 484–90. doi:10.1016/j.otohns.2009.07.007. PMID 19786217. ^ Tawfik HM, El-Maqsoud NM, Hak BH, El-Sherbiny YM (2011). "Head and neck squamous cell carcinoma: mismatch repair immunohistochemistry and promoter hypermethylation of hMLH1 gene". American Journal of Otolaryngology. 32 (6): 528–36. doi:10.1016/j.amjoto.2010.11.005. PMID 21353335. ^ Zou XP, Zhang B, Zhang XQ, Chen M, Cao J, Liu WJ (November 2009). "Promoter hypermethylation of multiple genes in early gastric adenocarcinoma and precancerous lesions". Human Pathology. 40 (11): 1534–42. doi:10.1016/j.humpath.2009.01.029. PMID 19695681. ^ Wani M, Afroze D, Makhdoomi M, Hamid I, Wani B, Bhat G, Wani R, Wani K (2012). "Promoter methylation status of DNA repair gene (hMLH1) in gastric carcinoma patients of the Kashmir valley". Asian Pacific Journal of Cancer Prevention. 13 (8): 4177–81. doi:10.7314/APJCP.2012.13.8.4177. PMID 23098428. ^ Agarwal A, Polineni R, Hussein Z, Vigoda I, Bhagat TD, Bhattacharyya S, Maitra A, Verma A (2012). "Role of epigenetic alterations in the pathogenesis of Barrett's esophagus and esophageal adenocarcinoma". International Journal of Clinical and Experimental Pathology. 5 (5): 382–96. PMC 3396065. PMID 22808291. Review. ^ Hofstad B, Vatn MH, Andersen SN, Huitfeldt HS, Rognum T, Larsen S, Osnes M (September 1996). "Growth of colorectal polyps: redetection and evaluation of unresected polyps for a period of three years". Gut. 39 (3): 449–56. doi:10.1136/gut.39.3.449. PMC 1383355. PMID 8949653. ^ Schmitt MW, Prindle MJ, Loeb LA (September 2012). "Implications of genetic heterogeneity in cancer". Annals of the New York Academy of Sciences. 1267: 110–6. doi:10.1111/j.1749-6632.2012.06590.x. PMC 3674777. PMID 22954224. ^ Lander ES, Linton LM, Birren B, Nusbaum C, Zody MC, Baldwin J, et al. (February 2001). "Initial sequencing and analysis of the human genome". Nature. 409 (6822): 860–921. doi:10.1038/35057062. PMID 11237011. ^ Yost SE, Smith EN, Schwab RB, Bao L, Jung H, Wang X, Voest E, Pierce JP, Messer K, Parker BA, Harismendy O, Frazer KA (August 2012). "Identification of high-confidence somatic mutations in whole genome sequence of formalin-fixed breast cancer specimens". Nucleic Acids Research. 40 (14): e107. doi:10.1093/nar/gks299. PMC 3413110. PMID 22492626. ^ Berger MF, Hodis E, Heffernan TP, Deribe YL, Lawrence MS, Protopopov A, et al. (May 2012). "Melanoma genome sequencing reveals frequent PREX2 mutations". Nature. 485 (7399): 502–6. doi:10.1038/nature11071. PMC 3367798. PMID 22622578. ^ Rasnick D, Duesberg PH (June 1999). "How aneuploidy affects metabolic control and causes cancer". The Biochemical Journal. 340 (3): 621–30. doi:10.1042/0264-6021:3400621. PMC 1220292. PMID 10359645. ^ a b López-Lázaro M (March 2010). "A new view of carcinogenesis and an alternative approach to cancer therapy". Molecular Medicine. 16 (3–4): 144–53. doi:10.2119/molmed.2009.00162. PMC 2802554. PMID 20062820. ^ Soto AM, Sonnenschein C (October 2004). "The somatic mutation theory of cancer: growing problems with the paradigm?". BioEssays. 26 (10): 1097–107. doi:10.1002/bies.20087. PMID 15382143. ^ Davies PC, Lineweaver CH (February 2011). "Cancer tumors as Metazoa 1.0: tapping genes of ancient ancestors". Physical Biology. 8 (1): 015001. doi:10.1088/1478-3975/8/1/015001. PMC 3148211. PMID 21301065. ^ Dean, Tim. "Cancer resembles life 1 billion years ago, say astrobiologists", Australian Life Scientist, 8 February 2011. Retrieved 15 February 2011. ^ Sterrer, W (August 2016). "Cancer - Mutational Resurrection of Prokaryote Endofossils". Cancer Hypotheses. 1 (1): 1–15. ^ a b Nowell PC (October 1976). "The clonal evolution of tumor cell populations". Science. 194 (4260): 23–8. doi:10.1126/science.959840. PMID 959840. ^ a b Merlo LM, Pepper JW, Reid BJ, Maley CC (December 2006). "Cancer as an evolutionary and ecological process". Nature Reviews. Cancer. 6 (12): 924–35. doi:10.1038/nrc2013. PMID 17109012. ^ Hanahan D, Weinberg RA (January 2000). "The hallmarks of cancer". Cell. 100 (1): 57–70. doi:10.1016/S0092-8674(00)81683-9. PMID 10647931. ^ Cho RW, Clarke MF (February 2008). "Recent advances in cancer stem cells". Current Opinion in Genetics & Development. 18 (1): 48–53. doi:10.1016/j.gde.2008.01.017. PMID 18356041. ^ Taniguchi K, Wu LW, Grivennikov SI, de Jong PR, Lian I, Yu FX, Wang K, Ho SB, Boland BS, Chang JT, Sandborn WJ, Hardiman G, Raz E, Maehara Y, Yoshimura A, Zucman-Rossi J, Guan KL, Karin M (March 2015). "A gp130-Src-YAP module links inflammation to epithelial regeneration". Nature. 519 (7541): 57–62. doi:10.1038/nature14228. PMC 4447318. PMID 25731159. ^ You H, Lei P, Andreadis ST (December 2013). "JNK is a novel regulator of intercellular adhesion". Tissue Barriers. 1 (5): e26845. doi:10.4161/tisb.26845. PMC 3942331. PMID 24868495. ^ Busillo JM, Azzam KM, Cidlowski JA (November 2011). "Glucocorticoids sensitize the innate immune system through regulation of the NLRP3 inflammasome". The Journal of Biological Chemistry. 286 (44): 38703–13. doi:10.1074/jbc.M111.275370. PMC 3207479. PMID 21940629. ^ Wang Y, Bugatti M, Ulland TK, Vermi W, Gilfillan S, Colonna M (March 2016). "Nonredundant roles of keratinocyte-derived IL-34 and neutrophil-derived CSF1 in Langerhans cell renewal in the steady state and during inflammation". European Journal of Immunology. 46 (3): 552–9. doi:10.1002/eji.201545917. PMC 5658206. PMID 26634935. ^ Siqueira Mietto B, Kroner A, Girolami EI, Santos-Nogueira E, Zhang J, David S (December 2015). "Role of IL-10 in Resolution of Inflammation and Functional Recovery after Peripheral Nerve Injury". The Journal of Neuroscience. 35 (50): 16431–42. doi:10.1523/JNEUROSCI.2119-15.2015. PMID 26674868. ^ Seifert AW, Maden M (2014). New insights into vertebrate skin regeneration. International Review of Cell and Molecular Biology. 310. pp. 129–69. doi:10.1016/B978-0-12-800180-6.00004-9. ISBN 9780128001806. PMID 24725426. ^ Kwon MJ, Shin HY, Cui Y, Kim H, Thi AH, Choi JY, Kim EY, Hwang DH, Kim BG (December 2015). "CCL2 Mediates Neuron-Macrophage Interactions to Drive Proregenerative Macrophage Activation Following Preconditioning Injury". The Journal of Neuroscience. 35 (48): 15934–47. doi:10.1523/JNEUROSCI.1924-15.2015. PMID 26631474. ^ Hajishengallis G, Chavakis T (January 2013). "Endogenous modulators of inflammatory cell recruitment". Trends in Immunology. 34 (1): 1–6. doi:10.1016/j.it.2012.08.003. PMC 3703146. PMID 22951309. ^ Nelson AM, Katseff AS, Ratliff TS, Garza LA (February 2016). "Interleukin 6 and STAT3 regulate p63 isoform expression in keratinocytes during regeneration". Experimental Dermatology. 25 (2): 155–7. doi:10.1111/exd.12896. PMC 4724264. PMID 26566817. ^ Vidal PM, Lemmens E, Dooley D, Hendrix S (February 2013). "The role of "anti-inflammatory" cytokines in axon regeneration". Cytokine & Growth Factor Reviews. 24 (1): 1–12. doi:10.1016/j.cytogfr.2012.08.008. PMID 22985997. ^ Hsueh YY, Chang YJ, Huang CW, Handayani F, Chiang YL, Fan SC, Ho CJ, Kuo YM, Yang SH, Chen YL, Lin SC, Huang CC, Wu CC (October 2015). "Synergy of endothelial and neural progenitor cells from adipose-derived stem cells to preserve neurovascular structures in rat hypoxic-ischemic brain injury". Scientific Reports. 5: 14985. doi:10.1038/srep14985. PMC 4597209. PMID 26447335. ^ Yaniv M (September 2014). "Chromatin remodeling: from transcription to cancer". Cancer Genetics. 207 (9): 352–7. doi:10.1016/j.cancergen.2014.03.006. PMID 24825771. ^ Zhang X, He N, Gu D, Wickliffe J, Salazar J, Boldogh I, Xie J (October 2015). "Genetic Evidence for XPC-KRAS Interactions During Lung Cancer Development". Journal of Genetics and Genomics = Yi Chuan Xue Bao. 42 (10): 589–96. doi:10.1016/j.jgg.2015.09.006. PMC 4643398. PMID 26554912. ^ Dubois-Pot-Schneider H, Fekir K, Coulouarn C, Glaise D, Aninat C, Jarnouen K, Le Guével R, Kubo T, Ishida S, Morel F, Corlu A (December 2014). "Inflammatory cytokines promote the retrodifferentiation of tumor-derived hepatocyte-like cells to progenitor cells". Hepatology. 60 (6): 2077–90. doi:10.1002/hep.27353. PMID 25098666. ^ Finkin S, Yuan D, Stein I, Taniguchi K, Weber A, Unger K, et al. (December 2015). "Ectopic lymphoid structures function as microniches for tumor progenitor cells in hepatocellular carcinoma". Nature Immunology. 16 (12): 1235–44. doi:10.1038/ni.3290. PMC 4653079. PMID 26502405. ^ a b Vlahopoulos SA, Cen O, Hengen N, Agan J, Moschovi M, Critselis E, Adamaki M, Bacopoulou F, Copland JA, Boldogh I, Karin M, Chrousos GP (August 2015). "Dynamic aberrant NF-κB spurs tumorigenesis: a new model encompassing the microenvironment". Cytokine & Growth Factor Reviews. 26 (4): 389–403. doi:10.1016/j.cytogfr.2015.06.001. PMC 4526340. PMID 26119834. ^ Grivennikov SI, Karin M (February 2010). "Dangerous liaisons: STAT3 and NF-kappaB collaboration and crosstalk in cancer". Cytokine & Growth Factor Reviews. 21 (1): 11–9. doi:10.1016/j.cytogfr.2009.11.005. PMC 2834864. PMID 20018552. ^ Rieger S, Zhao H, Martin P, Abe K, Lisse TS (January 2015). "The role of nuclear hormone receptors in cutaneous wound repair". Cell Biochemistry and Function. 33 (1): 1–13. doi:10.1002/cbf.3086. PMC 4357276. PMID 25529612. ^ Lu X, Yarbrough WG (February 2015). "Negative regulation of RelA phosphorylation: emerging players and their roles in cancer". Cytokine & Growth Factor Reviews. 26 (1): 7–13. doi:10.1016/j.cytogfr.2014.09.003. PMID 25438737. ^ Sionov RV, Fridlender ZG, Granot Z (December 2015). "The Multifaceted Roles Neutrophils Play in the Tumor Microenvironment". Cancer Microenvironment. 8 (3): 125–58. doi:10.1007/s12307-014-0147-5. PMC 4714999. PMID 24895166. ^ Venturi S (2014). "Iodine, PUFAs and Iodolipids in Health and Disease: An Evolutionary Perspective". Human Evolution. 29 (1–3): 185–205. ISSN 0393-9375. ^ Walsh CJ, Luer CA, Bodine AB, Smith CA, Cox HL, Noyes DR, Maura G (December 2006). "Elasmobranch immune cells as a source of novel tumor cell inhibitors: Implications for public health". Integrative and Comparative Biology. 46 (6): 1072–1081. doi:10.1093/icb/icl041. PMC 2664222. PMID 19343108. ^ Vogelstein B, Kinzler KW (August 2004). "Cancer genes and the pathways they control". Nature Medicine. 10 (8): 789–99. doi:10.1038/nm1087. PMID 15286780. ^ Brand KA, Hermfisse U (April 1997). "Aerobic glycolysis by proliferating cells: a protective strategy against reactive oxygen species". FASEB Journal. 11 (5): 388–95. doi:10.1096/fasebj.11.5.9141507. PMID 9141507. ^ Bos JL (September 1989). "ras oncogenes in human cancer: a review". Cancer Research. 49 (17): 4682–9. PMID 2547513. ^ Chang EH, Furth ME, Scolnick EM, Lowy DR (June 1982). "Tumorigenic transformation of mammalian cells induced by a normal human gene homologous to the oncogene of Harvey murine sarcoma virus". Nature. 297 (5866): 479–83. doi:10.1038/297479a0. PMID 6283358. ^ Vlahopoulos SA, Logotheti S, Mikas D, Giarika A, Gorgoulis V, Zoumpourlis V (April 2008). "The role of ATF-2 in oncogenesis". BioEssays. 30 (4): 314–27. doi:10.1002/bies.20734. PMID 18348191. ^ Matoba S, Kang JG, Patino WD, Wragg A, Boehm M, Gavrilova O, Hurley PJ, Bunz F, Hwang PM (June 2006). "p53 regulates mitochondrial respiration". Science. 312 (5780): 1650–3. doi:10.1126/science.1126863. PMID 16728594. ^ Knudson AG (April 1971). "Mutation and cancer: statistical study of retinoblastoma". Proceedings of the National Academy of Sciences of the United States of America. 68 (4): 820–3. doi:10.1073/pnas.68.4.820. PMC 389051. PMID 5279523. ^ Fodde R, Smits R (October 2002). "Cancer biology. A matter of dosage". Science. 298 (5594): 761–3. doi:10.1126/science.1077707. PMID 12399571. ^ Stephens PJ, Greenman CD, Fu B, Yang F, Bignell GR, Mudie LJ, et al. (January 2011). "Massive genomic rearrangement acquired in a single catastrophic event during cancer development". Cell. 144 (1): 27–40. doi:10.1016/j.cell.2010.11.055. PMC 3065307. PMID 21215367. Lay summary – The New York Times (10 January 2011). ^ Carrillo-Infante C, Abbadessa G, Bagella L, Giordano A (June 2007). "Viral infections as a cause of cancer (review)". International Journal of Oncology. 30 (6): 1521–8. doi:10.3892/ijo.30.6.1521. PMID 17487374. ^ Safdar A (1 June 2011). Management of Infections in Cancer Patients. Springer. pp. 478–. ISBN 978-1-60761-643-6. Retrieved 17 August 2011. ^ Samaras V, Rafailidis PI, Mourtzoukou EG, Peppas G, Falagas ME (June 2010). "Chronic bacterial and parasitic infections and cancer: a review". Journal of Infection in Developing Countries. 4 (5): 267–81. doi:10.3855/jidc.819. PMID 20539059. ^ Daniel FI, Cherubini K, Yurgel LS, de Figueiredo MA, Salum FG (February 2011). "The role of epigenetic transcription repression and DNA methyltransferases in cancer". Cancer. 117 (4): 677–87. doi:10.1002/cncr.25482. PMID 20945317. Review. ^ Pattani KM, Soudry E, Glazer CA, Ochs MF, Wang H, Schussel J, Sun W, Hennessey P, Mydlarz W, Loyo M, Demokan S, Smith IM, Califano JA (2012). Tao Q (ed.). "MAGEB2 is activated by promoter demethylation in head and neck squamous cell carcinoma". PLoS One. 7 (9): e45534. doi:10.1371/journal.pone.0045534. PMC 3454438. PMID 23029077. ^ Sampath D, Liu C, Vasan K, Sulda M, Puduvalli VK, Wierda WG, Keating MJ (February 2012). "Histone deacetylases mediate the silencing of miR-15a, miR-16, and miR-29b in chronic lymphocytic leukemia". Blood. 119 (5): 1162–72. doi:10.1182/blood-2011-05-351510. PMC 3277352. PMID 22096249. ^ Hitchler MJ, Oberley LW, Domann FE (December 2008). "Epigenetic silencing of SOD2 by histone modifications in human breast cancer cells". Free Radical Biology & Medicine. 45 (11): 1573–80. doi:10.1016/j.freeradbiomed.2008.09.005. PMC 2633123. PMID 18845242. ^ Baldassarre G, Battista S, Belletti B, Thakur S, Pentimalli F, Trapasso F, Fedele M, Pierantoni G, Croce CM, Fusco A (April 2003). "Negative regulation of BRCA1 gene expression by HMGA1 proteins accounts for the reduced BRCA1 protein levels in sporadic breast carcinoma". Molecular and Cellular Biology. 23 (7): 2225–38. doi:10.1128/MCB.23.7.2225-2238.2003. PMC 150734. PMID 12640109. ^ Dalerba P, Cho RW, Clarke MF (2007). "Cancer stem cells: models and concepts". Annual Review of Medicine. 58: 267–84. doi:10.1146/annurev.med.58.062105.204854. PMID 17002552. ^ Zhang W, Hanks AN, Boucher K, Florell SR, Allen SM, Alexander A, Brash DE, Grossman D (January 2005). "UVB-induced apoptosis drives clonal expansion during skin tumor development". Carcinogenesis. 26 (1): 249–57. doi:10.1093/carcin/bgh300. PMC 2292404. PMID 15498793. Tokar EJ, Benbrahim-Tallaa L, Waalkes MP (2011). "Chepter 14. Metal Ions in Human Cancer Development". In Astrid Sigel, Helmut Sigel and Roland K. O. Sigel (ed.). Metal ions in toxicology: effects, interactions, interdependencies. Metal Ions in Life Sciences. 8. RSC Publishing. pp. 375–401. doi:10.1039/9781849732116-00375. ISBN 978-1-84973-091-4. Dixon K, Kopras E (December 2004). "Genetic alterations and DNA repair in human carcinogenesis". Seminars in Cancer Biology. 14 (6): 441–8. doi:10.1016/j.semcancer.2004.06.007. PMID 15489137. Kleinsmith LJ (2006). Principles of cancer biology. San Francisco: Pearson Benjamin Cummings. ISBN 978-0-8053-4003-7. Sarasin A (November 2003). "An overview of the mechanisms of mutagenesis and carcinogenesis". Mutation Research. 544 (2–3): 99–106. doi:10.1016/j.mrrev.2003.06.024. PMID 14644312. Schottenfeld D, Beebe-Dimmer JL (2005). "Advances in cancer epidemiology: understanding causal mechanisms and the evidence for implementing interventions". Annual Review of Public Health. 26: 37–60. doi:10.1146/annurev.publhealth.26.021304.144402. PMID 15760280. Tannock I, Hill R, Bristow R, Harrington L (2005). The basic science of oncology (4th ed.). New York: McGraw-Hill. ISBN 978-0-07-138774-3. Wicha MS, Liu S, Dontu G (February 2006). "Cancer stem cells: an old idea--a paradigm shift". Cancer Research. 66 (4): 1883–90, discussion 1895–6. doi:10.1158/0008-5472.CAN-05-3153. PMID 16488983.